Key Research Organization(s): Salt Spring Imaging Ltd. This project is targeting undiscovered sulphide mineralization in BC's Belt-Purcell Basin -- host to the historic Sullivan mine, one of the largest lead-zinc-silver deposits in the world - using publicly-available earth science information. The Sullivan deposit in southeast BC was discovered by prospectors 125 years ago, in 1892, and the Sullivan mine produced almost 10 million tons of lead, 9 million tons of zinc and 337 ounces of silver in its 92-year mine life. Mining and smelting jobs have sustained the people of Kimberley, Nelson and Trail for generations. There have been many attempts to find ‘another Sullivan mine’ in southeastern BC, with most work focused on the ‘Sullivan time’ or ‘Sullivan horizon’, specific rock units known to be associated with mineralization. Zones above and below this horizon have demonstrated economic potential in other parts of BC (e.g. St. Eugene vein system near Moyie) and the United States (e.g. Troy, Montanore and Rock Creek deposits in Montana) suggesting that there is undiscovered mineral potential in southeast BC. This project is addressing the needs of explorers to unravel the complexly-folded rocks below the surface and locate areas of increased mineral potential in southeast BC. Correlate geology, seismic reflection data and MT inversions to help delineate stratigraphically controlled zones with high electrical conductivity that may contain sulphide mineralization. 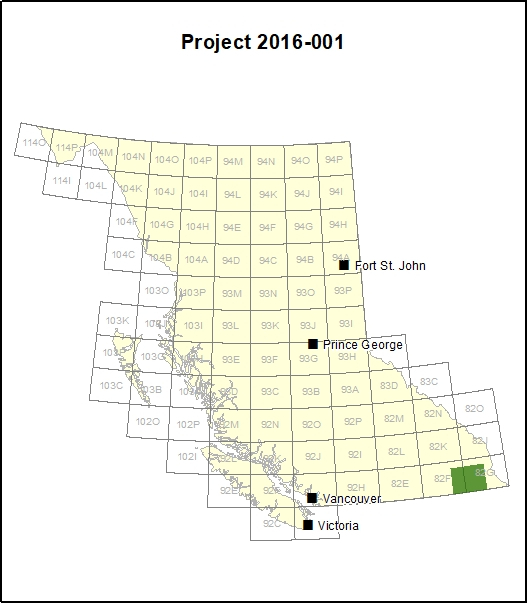 This project is using existing geological and geophysical data to identify potential zones of interest in southeastern BC. The virtual two-dimensional (2D) slices through the earth created during this project provide new and valuable insight into the relationships between elevated electrical conductivity and rock layers delineated by seismic profiles, to hone in on areas of elevated mineral potential, similar to that found at the Sullivan mine. The products of this study will stimulate new exploration interest in the region and help to guide future exploration. This data could also be used by communities, Indigenous groups and government when considering economic development and land use planning. The project is focused on the Purcell Anticlinorium in southeastern British Columbia around the communities of Kimberley and Cranbrook south to the BC/USA border. The Purcell Anticlinorium is a massive geological structure that contains some of the oldest rock exposures in the Pacific Northwest as well as some of BC’s most prolific mineral deposits. This project used publicly-available earth science datasets. Geophysical data for this project comes from the University of Calgary (Seismic Reflection profiles and a deep exploration drill hole originally conducted by Duncan Energy in the mid-1980’s) and the Geological Survey of Canada (magnetotelluric data). Additional geological information came from existing maps for the region.